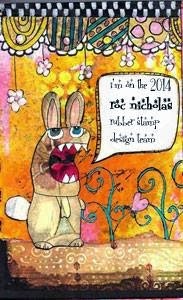 I created this postcard as my July submission as part of the Roc Nicholas Rubber Stamp Design Team. It features three Roc Nicholas Rubber Stamps: Roc's Angel, Stacked Love, and Scalloped Lace Border. Love this Cathy! It's awesome!